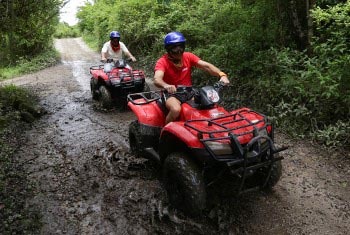 Ride a powerful ATV quad in a wild off-road adventure to discover a lost cenote “oasis” deep into the jungle amid ancient Mayan vestiges. 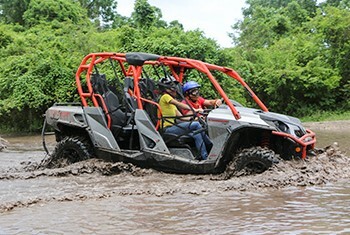 Experience an off-road adventure on a four-seater, cutting age, 4x4 Recreational Off-road Vehicle. Make your way into the jungle to the Jade Cavern, a remote “oasis” amid lush vegetation and a freshwater Cenote. 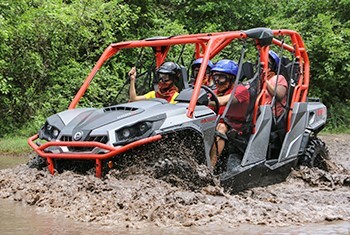 Have all the fun just for you and your dear ones driving your own four-seater 4x4 Recreational Off-road Vehicle. Make your way with your party deep into the jungle for a hidden Cenote amid lush vegetation. 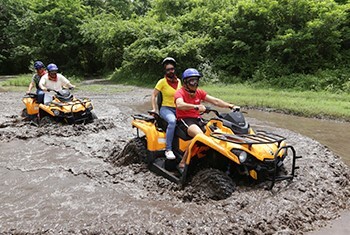 Wild Tours, hereinafter WT, reserves the right to make any changes to the tours, including but not limited to changes of itinerary or timings due to severe weather conditions, force majeure, or any other factors, at any time. WT will ensure that you are promptly notified of any significant changes once we become aware of such change if there is time before your departure, but we accept no liability for any changes or costs incurred that may apply. Subject to these terms and conditions, you may have then the choice of accepting an offer of alternative tour arrangements if any is available or canceling your booked arrangements receiving any applicable refunds if any. WT reserves the right to cancel or alter tours, pending full refund, for reasons of safety or feasibility. If any excursion must be abandoned through force majeure or difficulties on the route, the best possible refund will be arranged according to the circumstances, however, if due causes whether they be, are completely out of the control of WT no compensation may apply. WT will agree on refunds for all canceled tours if applicable, in its sole discretion. In order to claim or process a refund, customers must send a refund request to reservations@wildtours.com within 15 days of tour´s date. If cancellation occurs more than a week before departure – FULL REFUND. If cancellation occurs within a week and the previous 24 hours before departure - 80% REFUND. If cancellation occurs less than 24 hours before departure – NO REFUND. No refund will be made to any customer, if once at the meeting point, changes their mind and chooses not to participate on the tour, for any circumstances such as weather conditions, when in accordance with WT the tour is safely operable. Above anything else, be aware that by using or accessing this website and its content, you consent to abide by the terms and conditions herein stated. WT collects no personal information beyond what you freely and voluntary disclose to us for registering in any of our tours, phone conversations, names, dates and anything related to organize and provide you with the service you are interested in. WT DO NOT use this information to attempt to sell or push anything else nor disclose this information to third parties. We basically use it to provide you with the final service you payed for. Regular email exchanging whether it be for us to confirm your reservation or any inquiring or questions you may have. Information corresponding to any particular reservation such as name, number of adults and children, time, date, location, where are you going to be staying at and when. We do not collect credit card payment information from you, instead, PayPal and its related services actually process and take care of your payment data. We may require and keep information from you when reporting a problem or a service mismatch. We collect no personal data from you, but the necessary, to provide and deliver our services to you. Standard intercommunication between our site and your computer. This information is actually not actively provided by you, but the current internet technology requires the identification of your Internet Protocol (IP) Address, even though it is conventionally not classified as personal information, it can be traced back until your internet provider. Another topic related with the information you provide are your comments and written contributions. You can freely contribute to WT’s webpage content by commenting your own experiences about our services or rating the contributions and experiences of other users. Any personal information you decide to publicly disclose as part of your contribution is completely up to you and WT has no control on the eventual use any other user can do of it. HOW DOES WT USE YOUR INFORMATION? We do use your booking information for booking administration and to manage our obligations after agreeing to provide services for you as well as to contact you for notifying any changes or pertinent information regarding your purchase. WT uses NO cookies nor any other technology to store within your computer. Cookies are widely use to collect information from your browser such as to identify you as a former visitor, preferences and even to configure the advertising based on your internet behavior. WT have no intention to influence on you nor push to sell you anything. To safeguard all information that we gather from you, we use a third-party secure and remote location to site our servers and data. All intercommunication is protected with the available technology and a protocol of controlled access. We do not store payment information as it is handled by PayPal+. WT do not share, trade or transfer your information to third parties whether they be suppliers, affiliates or distributors, however, you may supply information to some distributors before you have actual contact with WT, even though we partner to trusted companies, we have no control on their information security procedures and who else may have access to your information. With the express intention, of providing a simple and easy browsing experience within www. wildtours.com, WT doesn’t have third-party links, exception made for PayPal, which process our collection procedures for its well-known trust and security. You may expect to receive booking confirmation and other related formalities via e-mail. WT won’t e-mail you with marketing purposes unless you require specific information about any of our products. WT values your privacy. WT’s site does not target children neither young underage teenagers; its content is directed to adults. In Mexico the legal age-of-majority starts at 18 years old, age of which persons assumes the responsibility and consequences of their actions and decisions. We expect people selecting their tours, booking and buying with us do it on their own free will. If for any reason WT detects the arrangements are not done for adult responsible people, WT will proceed to cancel all due arrangements and erase all minor’s personal information. WT doesn’t receive nor service minor guests if no parent or legal tutor is personally supervising and taking care of them. As a result of a continuing evolution on technology, and local and international legislation in favor of the privacy of internet users, we may, at any time, change, renew or improve the terms of the present policy which will only apply on data gathered from the date herein disclosed. This policy was last modified on May 25, 2018. Your booking expressly releases WT for any liability, of any kind, for such participation, including all of your personal belongings such as cameras, smartphones, handbags, etc., WT is not responsible for their loss, damage or theft while the tour is being operated. WT highly recommends you not to leave your possessions unattended at any time. WT acts in good faith, and cannot be held responsible for any inconveniences find in the route, as defaults or weather-related delays, that are out of its control. WT also reserves the right to alter routes, itineraries or departure times, without prior notice, if the necessity arises. Customers are obligated to follow the directions of professionals, such as tour guides, regarding safety and regulations. WT does not assume any responsibility for accidents caused by reckless behavior, or failure to notify of any special or medical needs. Please note that your participation in any tour may also be subject to local laws and regulations. Bookings occur through the website www.wildtours.com, any booking shall be deemed as an offer by you to purchase the tour of your choice. No contract between you and WT shall come into existence until WT accepts full payment and issues a confirmation invoice, your reservation may not be confirmed until availability is confirmed and you receive your electronic ticket in your e-mail. The booking customer accepts these conditions on behalf of all members of his/her party and is responsible for all payment due from the party. By submitting a booking, you warrant and confirm to WT that you agree with these arrangements. You further validate that all information submitted is accurate and up to date to the best of your knowledge. WT does not accept liability for any problems which arise due to insufficient or inaccurate information provided by the customer. All of the tour descriptions at WT are verified and published by our team. In the extremely rare case, your tour does not represent the description read in www.wildtours.com WT will take full responsibility and any complaint should be resolved at the moment. Any claim regarding your tour must be addressed in the court of general jurisdiction in Cozumel and abide by the laws of Quintana Roo State and/or Mexico’s federal legislation. It is customer´s full responsibility to make sure that all arrival and departure times/dates of their cruise, flight or hotel reservations are in accordance with the tour schedule, being aware of the possible time difference with Cozumel’s local time. If your cruise or flight itinerary changes, please be sure to let us know as soon as possible to reservations@wildtours.com so we can arrange your accommodation on a different day and schedule. WT can only guarantee a full refund if your cruise or flight does not make it to Cozumel for any reason that is not under customer´s control. In case you have any comments regarding any tour, please be sure to contact your WT representative in the site or to WT’s customer service department at reservations@wildtours.com as soon as possible in order to provide WT with the opportunity to address it properly. WT assumes no liability for comments that are not properly brought to our attention with sufficient notice for us to resolve or attempt to resolve them. Any comment made after the completion of a tour must be received within 30 days of the end of the tour. Client acknowledges and agrees that WT will not accept any liability for comments received after this period. All of the posted prices on this website are in U.S. Dollars and they are subject to any changes at any time. As WT is fully committed to customers care and satisfaction, you can trust that WT will respect the price published at your booking time, even though if the prices changed before the operation. For your well being, certain legal requirements apply for you to participate in any tour, such as minimum age or medical conditions. It is customer´s responsibility to be aware of their selected tour restrictions, WT will not grant any refund if these requirements are not fulfilled and the tour participation is denied. This also applies to any medical, allergic, diet (for tours in which a meal is included) or mobility conditions. Please be sure to let us know any details, we must be aware of in order to make the necessary arrangements for you to participate if possible. Copyright © 2018 All Rights Reserved to Wild Tours SA de CV.